We design, build and sell beautiful premium quality ball and stick models and other models for teaching, museum displays, presentations, awards, legal cases and for anyone who just wants a stunning scientific model. 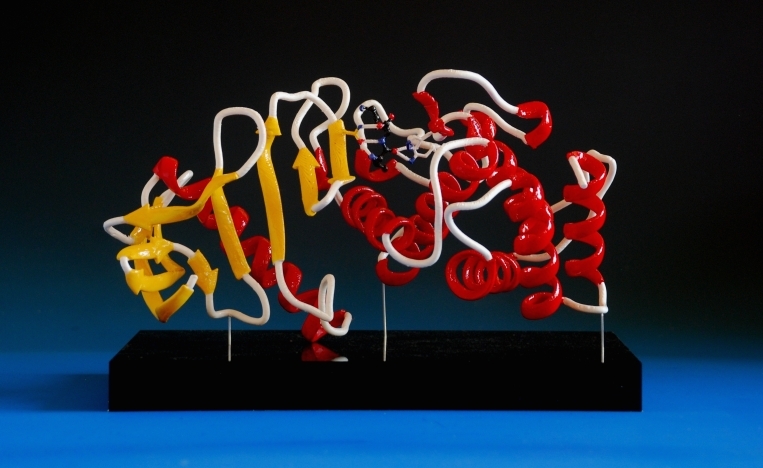 Molecular Models are a vital and engaging part of education in chemistry, and a useful tool for demonstrating conceps and materials to colleagues and customers. They provide a wonderfully tangible, tactile and interactive way to demonstrate the relation between molecular structure and chemical function that cannot be replicated with, for example, computer imaging. What's more, our models simply look stunning, and enhance any desk, office or laboratory. 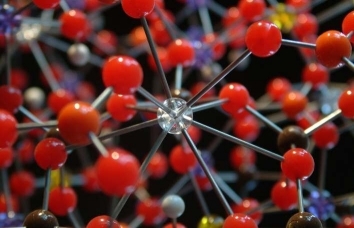 Pre-constructed ball and stick molecular models comprise the majority of our products, and represent some of the finest crystal structure models that can be purchased. We have the widest range of scales of molecular structure models in the world, ranging from a scale of 1cm=1Å (“Beevers’ Models”™) through to our giant molecular models at a scale of 20cm=1Å or greater. These models are all made to order, and nothing is 'standard' about them - if a bond angle in a tetrahedrally coordinated atom in the structure is 112°, the balls are drilled with holes arranged at that angle - there is no need to compromise by having to use regular tetrahedral coordination - and that can make all the difference between representing features that exist in a crystal and having to do without them. Because our models are all made to scale, you also get to see the relative sizes of crystal structures - with regular kits, for example, a diamond unit cell is much larger than that of sodium chloride, whereas in reality (and in our models) the opposite is true. Our Beevers Models are made with acrylic balls and steel rods, but we also work with a wide range of materials to suit your purpose and your budget. 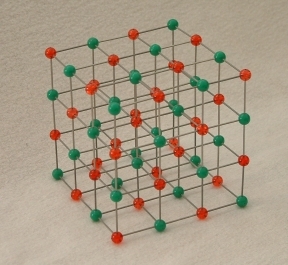 We have make and sell molecular and crystal structure models in acrylic, phenolic resin, wood, brass, aluminium, silver and a host of other materials. The accuracy and compactness of our Beevers’ Models™ system allows our model range to extend over the complete spectrum of 3-dimensional structures in Chemistry, Biology, Geology, Physics and Mathematics. 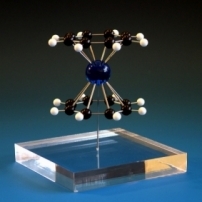 Our huge list of Beevers' ball and stick models for sale from our catalogue includes crystal structure models, biological, physical, mathematical and crystallographic teaching models. 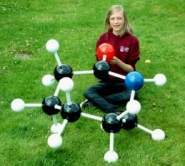 We also make an extensive range of models of organic and inorganic molecules - or any compound you want to order. 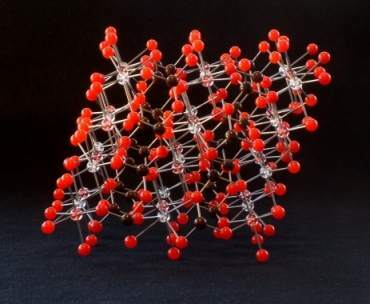 All the usual favourites are available: DNA and RNA, inorganic molecules such as fullerenes (buckyballs), from C28 through C60 and C70 to C720 and beyond, inorganic structures such as NaCl or YBCO, as well as materials you have probably never encountered, such as Thorium Zinc Carbide. Even if the material that you want is not in our catalogue, we will still be able to make your structure, whatever its size - all we need are the crystallographic details or node coordinates. All our molecular models are made accurately and to scale, making it possible to directly measure angles and lengths, to visualise the relative scale of different structures and to show how, for example, a solvent molecule can enter into a porous structure. With other model systems, this simply isn't a reliable option. With our models, you can immediately see, for example, why diamond is more dense than graphite and why zeolites absorb some compounds and not others. Kits for any of our models can be supplied on request (as long as you are aware and accept that they are not as easy to put together as most people expect). Because our models are largely designed for display or teaching specific crystallographic or structural concepts, they are not the sort that you can take apart and rebuild, and so we don't make models like other manufacturers do. By their nature, therefore, our Beevers models don’t readily lend themselves to being sold as kits. That being said, however, we routinely make kits for our and large and giant models. These are fantastic for teaching, for museum activities and for fun activities. Examples of our models can be seen throughout our web-site. Please use the links above to find out more about our products, search our catalogue, or to inquire about having us make a model of your structure.